Until now, delivering on our promise of rock solid wireless has always required that a BRIDGE or Sonos player be connected to your router. In the latest free software update (version 5.1), we’re finally able to deliver what we’ve been working so hard to achieve - incredible wireless performance that is uniquely Sonos, all without plugging anything into your router. Alternate setup. During the setup process, you may be prompted to temporarily connect one of your players to your router with an Ethernet cable if your device does not support standard wireless setup (see the Compatible Operating Systems table below). At the end of the setup process, you can disconnect the Ethernet cable and move your Sonos player to a different location. If you already have a BRIDGE, we recommend you leave it connected - you are already experiencing the benefits of having a separate wireless network exclusively for your Sonos system. · Larger homes where the WiFi performance isn’t reliable or doesn’t reach all of the rooms where you want music. · Homes where the WiFi network is already in high demand with streaming video and web surfing and you want to create a dedicated wireless network exclusively for your Sonos speakers. · Sonos 3.1 or 5.1 home theater system setup (BRIDGE setup is required if you want to pair a Sub and/or a pair of rear surround speakers with your Playbar). · If you don’t have a music library set up, you will no longer see the Music Library option in the SONOS music menu. For help creating or managing your music library, go to http://faq.sonos.com/manage. · Your Sonos controller will now auto-connect to Sonos if there is only one Sonos system on the network. 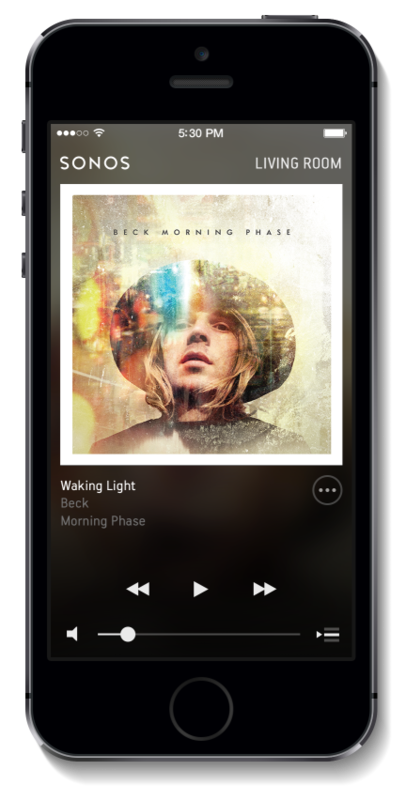 o From the SONOS music menu on your iOS or Android device, select Settings -> Advanced Settings. Touch Beta Program, and then follow the on-screen prompts. Manage Service has been removed from the Add Music Services menu option. Replacing, removing or reauthorizing a music service, as well as changing a music service password now appears under Settings -> My Services on your iOS or Android device. · Version 5.1 also includes several security and networking enhancements. Beginning with Sonos software version 5.1, only iOS devices running iOS 6 and higher are supported. When this update is initiated in your household, iOS4 and 5 devices, including the 1st generation iPad, iPhone 3G, and 2nd and 3rd generation iPod touch, will no longer function as Sonos controllers. This update is irreversible. Starting with release 5.1, you can no longer use the SONOS CONTROL to tweet what you are listening to. Instead tweet straight from the Sonos app on your smartphone or tablet. Release 5.1 includes a slight SONOS Play:3 WiFi transmission power reduction. In the unlikely event you experience a wireless issue with your Play:3, you can go to www.sonos.com/support for more information.